G.M. 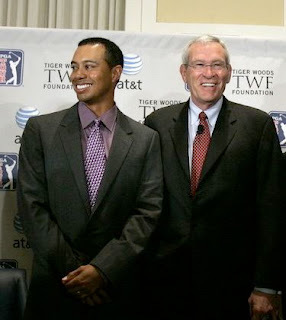 's chief Ed Whitacre (right) and some guy named Tiger Woods. Since taking over, Mr. Whitacre has wasted no time. He has promoted several young executives to senior positions, including naming Mark Reuss, a 46-year-old engineer, as head of North American operations. Mr. Whitacre has also been meeting with employees at all levels of the company, including spending a day last week at G.M.’s pickup truck plant in Flint, Mich.